It might not look like much, but it makes a big difference. 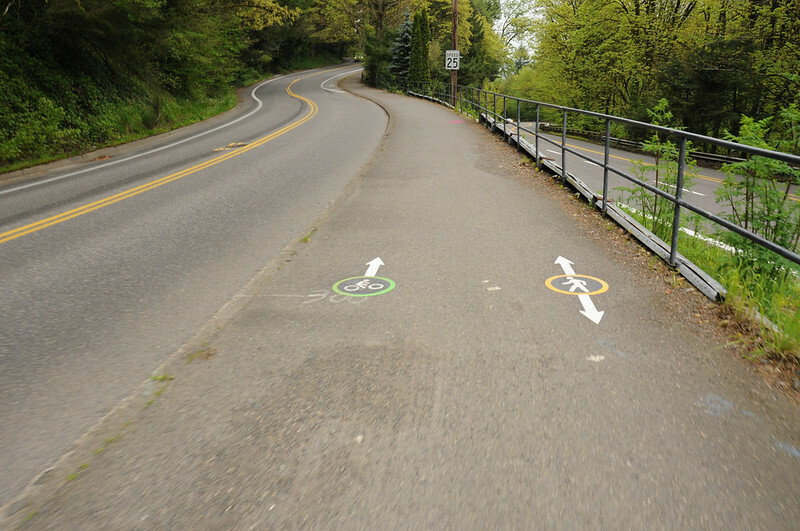 Slowly but surely, the City of Portland is improving bikeways in southwest. 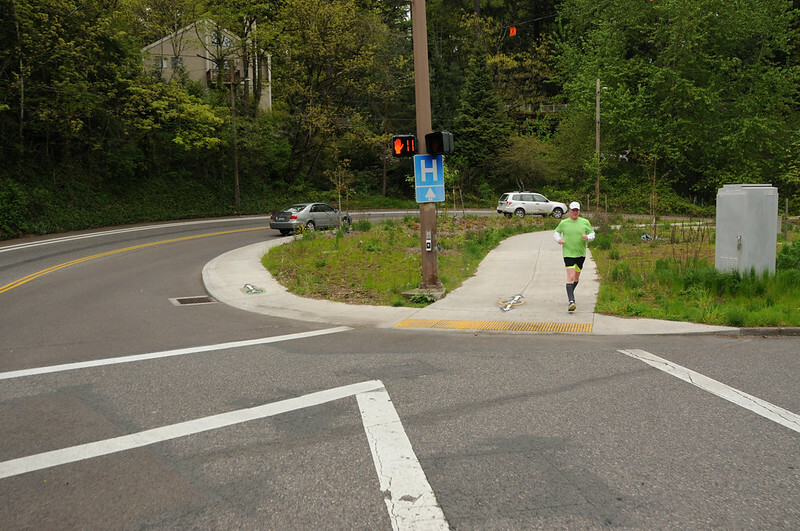 Case in point are the recently completed changes to the intersection of SW Capitol Highway and Terwilliger (a.k.a the “teardrop”). People who ride in this area know the intersection well because it was a common place for close-calls. I experienced this first-hand during a ride-along with a southwest Portland family in 2012 (see photo below). The curvature of the road, mixed with the unprotected bike lane was a bad combination. 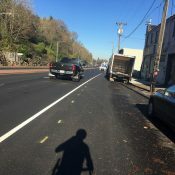 Fortunately a Portland Water Bureau project provided the impetus to finally fix the bikeway and make something much safer (and we were fortunate that a volunteer advocate spoke up to make sure it happened – thanks Keith Liden!). As you can see, in addition to the new grade-separated bike lane, PBOT has restriped the notorious s-curve in both directions. They widened the southbound bike lane, gave it a generous (but only painted) buffer, added a mini-bike box at the intersection, and added a few cross-bike markings into the intersection for good measure. 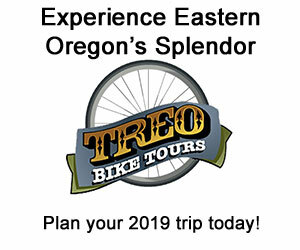 As for the teardrop itself, there are separate paths for bicycling and walking and pavement markings throughout to let you know where you should be. The design overall is straightforward. North of Capitol Highway the paths re-connect and then bicycle users are directed back onto the unprotected Terwilliger bike lane (via a curb cut and arrow markings) a few hundred feet later. 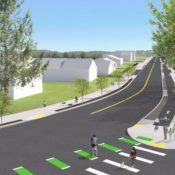 This is an important intersection because of its location at the crossroads of a major north-south bike route (Terwilliger) and the main access road between Barbur Blvd and Hillsdale (Capitol Highway). Southwest resident (and the subject in that harrowing photo above) Barbara Stedman says, “The changes are a big improvement. 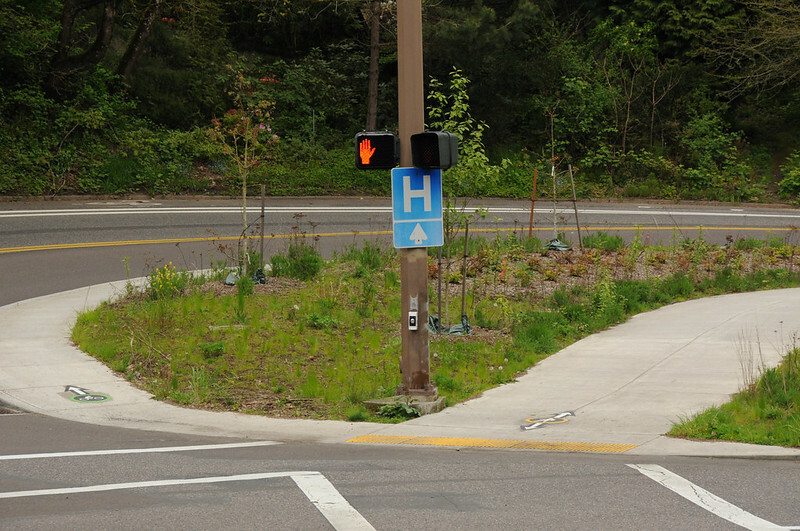 Widening the street and adding the cycle path and MUP to the sidewalk was very helpful.” Stedman worked with PBOT and volunteer advocate Keith Liden to design the bikeway. She also mentioned that the sharp curve to the left at the split of the bike and walkways is “kind of awkward” (especially since it comes on a slight downhill when people on bikes have a bit of speed) and that many people ride on the walking path instead. 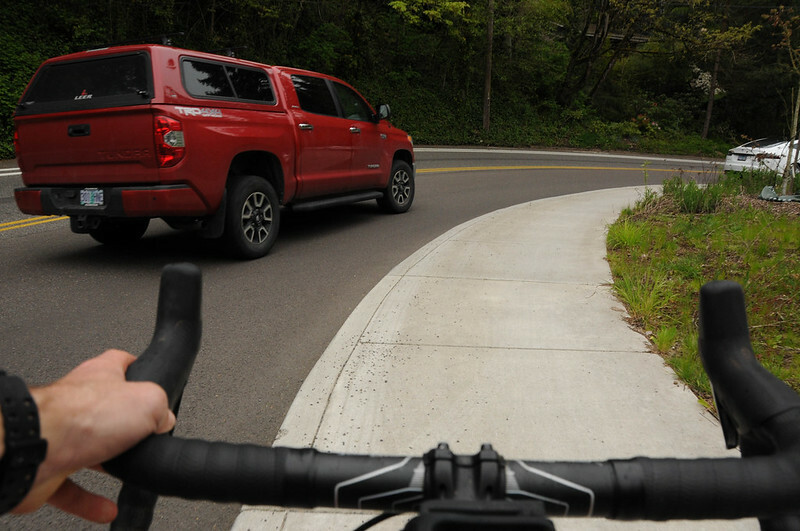 I also noted that on the section of Terwilliger right outside of downtown Portland (near the Sam Jackson intersection), PBOT has repaved the street and widened/buffered the bike lane. 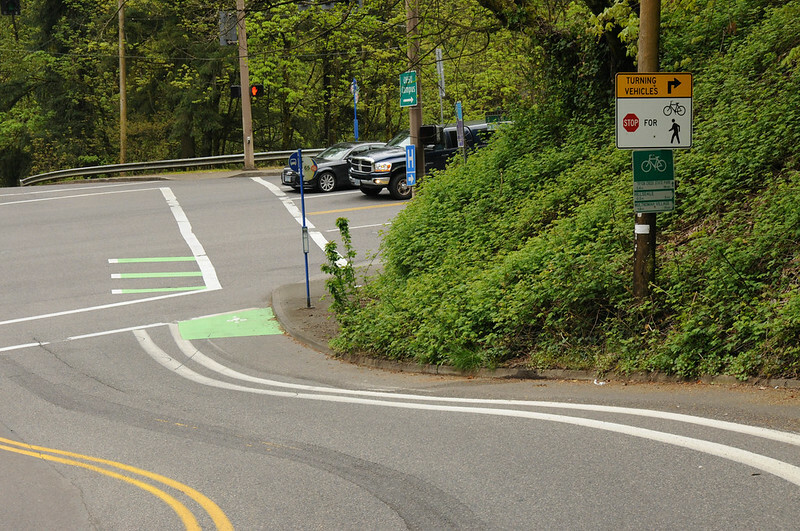 It’s great to see improvements like this and they follow a positive trend of PBOT upgrading bicycle infrastructure whenever they repave or do other projects. Do you ride through here? What do you think about the upgrades? As someone who used to ride this daily for almost three years before the change, I’m glad that they eliminated this gap in the network as it was every bit as dangerous as your description. The extra striping opposite the cycletrack is even more important as vehicles often cut into the bike lane when it was narrower and prevented passage during high traffic times of day. It would have been nice if they could have had the bike path track alongside the pedestrian walkway as that teardrop is awkward but this is dedicated and grade separated so this is minor in the scheme of things. Here is hoping the city can grow to 10 miles of protected bike lanes by the end of the year (look for the MUP on BHH this fall/winter hopefully). Would be better if it was wider and didn’t have a mountable curb. It does not have a mountable curb. It definitely needs to be wider. Anything faster than 12mph here feels dicey to me as the camber pushes you out toward the square curb while traffic is picking up speed in there nice, wide lane. Better to ride the roadway if you’re moving at 16-20mph, especially given the downhill and slim-to-none bike lanes leading in from west and south. Also better to take the sidewalk up the middle, with generally less risk and even sometimes less pedestrian conflict there anyway. 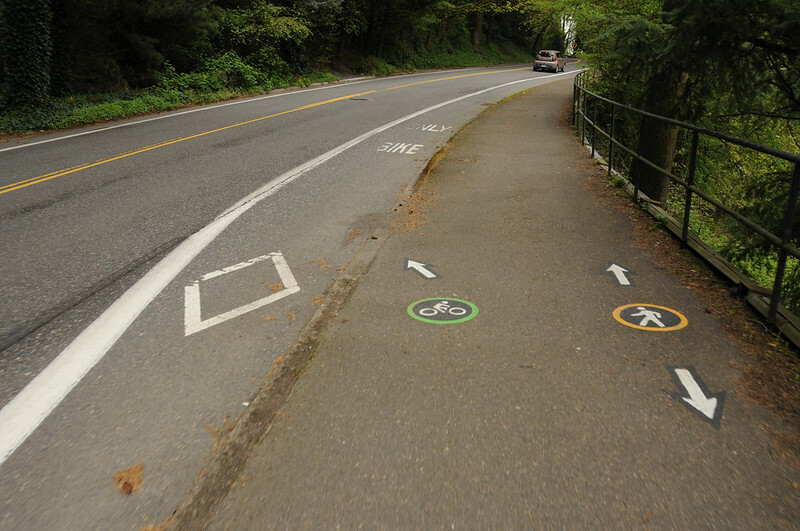 Why does PBOT think they can just draw 5ft sidewalks and call them bikeways? They plan a design speed for cars, but no such consideration for bikes. We do want people to choose bikes as a mode of transportation before driving alone in a car, right? Let’s not treat them like they’ve got plenty of time to slow down for bad designs. The speed limit here is 25mph. Agreed, cycleways should be asphalt rather than concrete, and designed for faster-than-walking pace. I haven’t ridden it, so if you have, I’ll take your word for it, but in this photo there appears to be a mountable curb. 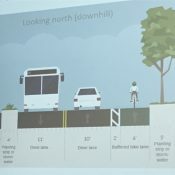 If you look at some of the other photos in this article that have different angles you can see it’s a sheer edge, non-mountable except for cars, trucks, and buses that feel like some offroading or decide to cut the corner. Agree. I think this is great for the hesitant, or slower biker, but there is no way I would take it with any sort of speed, the road being best for that. Also, why bother making it wider? Confident riders will take the road, others the path or this. Money is better spent elsewhere. This is a big frustration of mine as well. I can think of lots of examples where a bike lane, MUP, or cycletrack makes an abrupt turn with a tiny radius. Engineers would never do the equivalent for motor vehicle infrastructure. Man, I hate that grinder! Nice, parallel edge slip off in your path. I’ve asked, after suffering one in my commute to the Lloyd district, that as a matter of policy they do an asphalt patch any time they grind in a bike lane. The cycle track looks to be bathed in pea gravel (N Vancouver over the Slough being another). I realize that this winter was harsh, but short of the Larch Mountain gate, the snow in Multnomah County is long gone and it’s not as if PBOT could have missed this. “First class” indeed. Small wonder I prefer the roads. City definitely needs to have Commish Fish and Director Treat come out here in orange vests, holding brooms, to draw attention to their commitment to removing gravel on key cycle paths, connector sidewalks, and bike lanes. I guess they could have a one day media event to show everyone how tuned into the issue they are – and then forget about it for a few more years. PBOT actually just cleaned up the gravel yesterday, after I reminded them. They don’t feel responsible for “sidewalks” even after they renamed them MUP and there is no adjacent property owner (other than the city) to be responsible. It was especially problematic in the curve and coming at high speed. 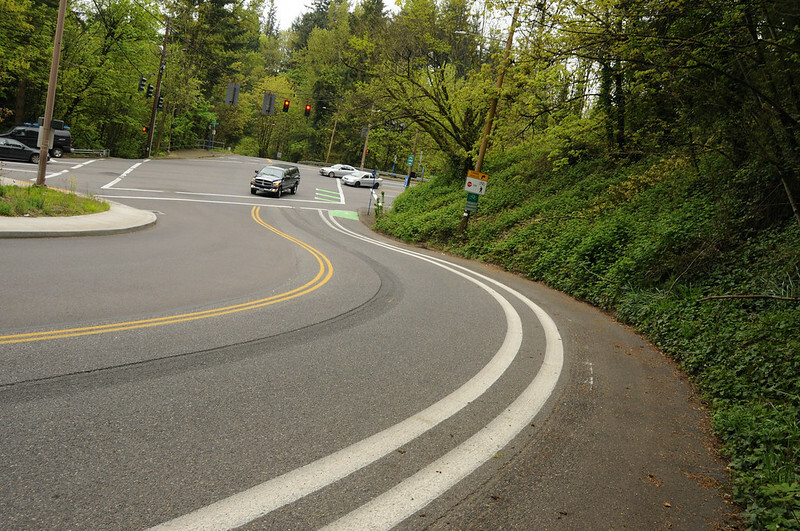 Nice, but the car speeding and “banked” curves of Terwilliger need to be addressed. I couldn’t agree more. Easily > 50% of the drivers on Terwilliger go much faster than 25. Why is it so hard to have more speed traps in this city? They will easily pay for the extra human hours. 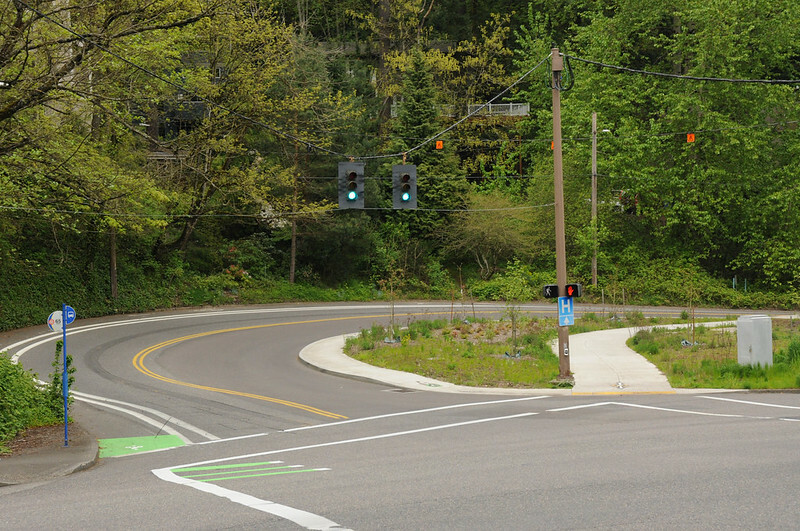 Many people just simply drive faster than 25 mph through the Terwilliger Parkway. The sewer / water line project at this same location later had new Doug-fir trees planted. Lots of Ivy have killed trees around Terwilliger. I have a different outlook on this project and Terwilliger in general. I ride this route twice a day. 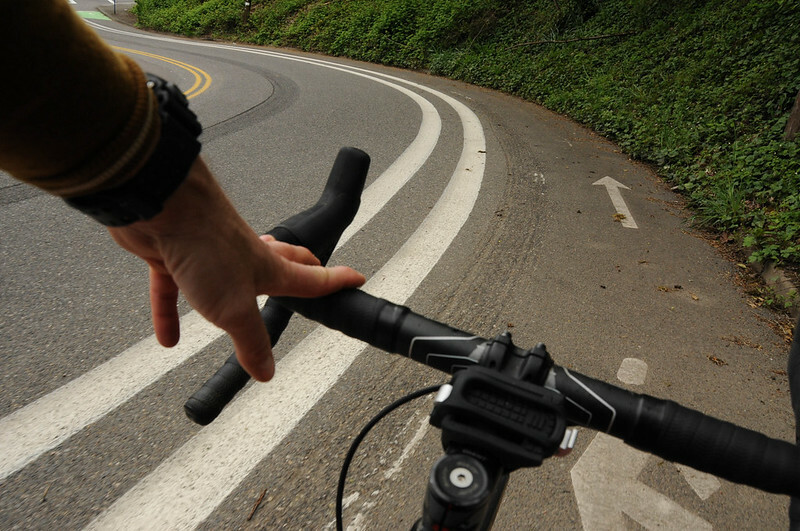 The improvements at SW Capitol make for an awkward left hand turn as one is riding downhill at speed. I will always take the route marked for peds if it is clear (9 times out of 10 it is clear). 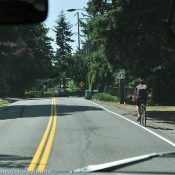 The southbound bike lane of Terwilliger is often debris-strewn or one is faced with vegetation hanging into the bike lane. The southbound bike lane between Terwilliger and Caruthers-ish is often full of dirt and rocks from the cut bank right next to it. A painted buffer does little good when your bike lane is full of large rocks! That section also has a lot of traffic in the commute periods. This is really a shame because that whole corridor would be so easy to convert to a two-way cycletrack that would make commuting between SW and downtown a lovely experience. As it is, I often ride on the asphalt “sidewalk” when headed southbound to avoid all the crap in the southbound bike lane. Peds there seem to understand (at least I haven’t been yelled at yet or been the subject of some passive-aggressive behavior) and I appreciate their forebearance. I avoid riding this route after dusk altogether because of the poor lighting and all of the debris there. I believe the low bike commute numbers out of SW would dramatically change if this route were properly constructed. Do you think some of the the Parks Department-owned car parking spots on Terwilliger should be removed ? I agree, big bold changes are needed, a revolution even, but given Americans’ passivity (except when driving), all I can get as an activist are small baby steps. Politicians afraid of voters, bureaucrats afraid for their jobs, traffic enforcement police afraid of everyone, it’s a wonder we ever get anything achieved these days. For the many people who walk, run, or take a wheelchair on that connection at times. More TriMet service is approved for SW.
Agree. I always take the shorter route. I don’t know why they waste time/money putting down those markers (here as well as on the Tilikum). This area was finished for at least a year without having the bike/ped signs and there were of course no problems. That’s because there is just not a lot of either traffic there; and when there is, people can figure out what to do. I can see taking the cycletrack if you are stopped at the left turn light, but if you get the green coming downhill from Capital it is too narrow…..I take the lane. I think the intersection needs better striping as well. I do like the new buffered bike lane on the capital highway to Barbur northbound curve further east/downhill from here. It has really slowed down traffic. •	Creating plans, such the Portland Bicycle Plan for 2030, are short and easy compared to implementation, which is long and hard. •	While large transformative projects are great, we also need to capitalize on small cost-effective opportunities when we get them. Every time a street is modified, repaved, or rebuilt, PBOT should ensure compliance with the bike plan (and TSP) whenever possible. 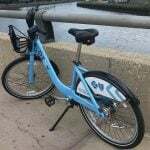 •	There are probably relatively few bike facilities in the city that please everyone or make all types of riders feel safe – perhaps partially explaining our low ridership compared to our goal for a 25% bike mode split. •	The project wasn’t just about cyclists. Pedestrian advocates wanted separation from cyclists, and the Water Bureau and BES (these bureaus were behind the initiation of this project in the first place) had design requirements for their new facilities within the teardrop. 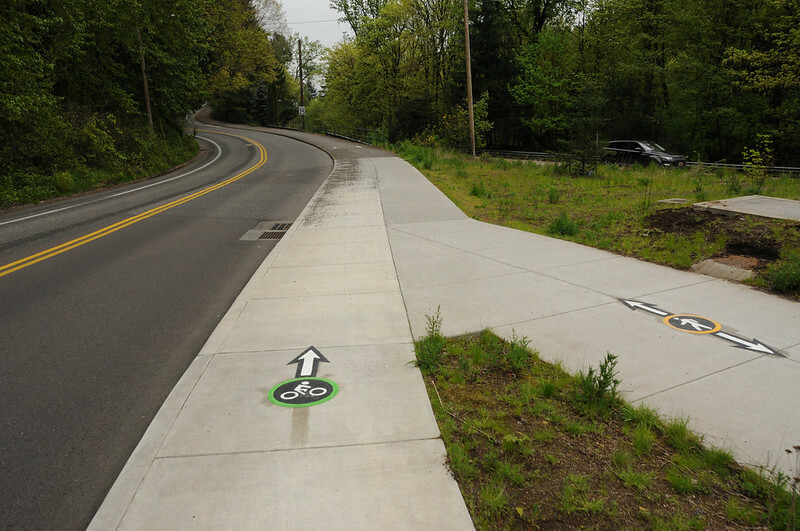 •	The cycle track design is relatively unique in Portland, and we can learn from its performance to potentially fine-tune this approach when/if it’s applied elsewhere. Yes, and with several other legal requirements to do the right thing: (a) the “ped and bike bill” ORS 366.514 which requires ped and bike facilities “wherever a highway, road or street is being constructed, reconstructed or relocated”; (b) the ADA under which compliance often results in ped and bike access as well; (c) the “duty to make travel reasonably safe to the general public” set forth by the Oregon Supreme Court as to ODOT in Little v. Wimmer, 303 Or 580, 589, 739 P2d 564, 569 (1987); and (d) public nuisance law which may also apply to a dangerous roadway. This used to be on my daily commute. I think it’s an improvement, but it was never a huge trouble spot (my bigger concern was uphill from there: the risk of cars backing out onto Capitol Hwy while I’m flying downhill at the speed limit in the bike lane). The reason I never had problems at this spot is that it’s downhill through the intersection if you’re making the left turn from Capitol: I’m a slower climber, but I’m fast off the line and down hills, so I could carry a lot of speed around that curve, then drift to the right as the slope turned uphill and slowed me down. 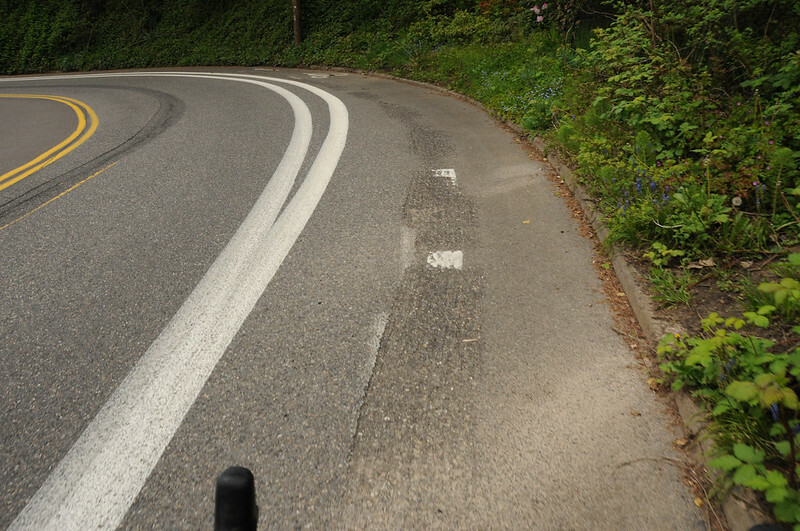 Slower cyclists might really appreciate the change, though. 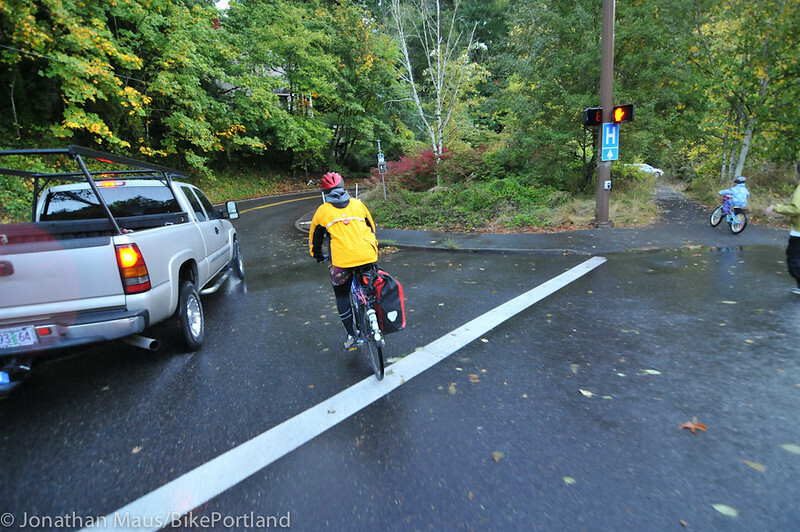 My bigger problem was that the bike lane on Terwilliger didn’t start early enough. The shortcut pedestrian path may be confusing for first-time riders through this location, and I suspect the markings may come up on them too fast to react accordingly. Before that path was paved, IIRC it was dirt or gravel and I sometimes used to take the shortcut, then hop off the curb once the bike lane started on the uphill. The start of this lane, going north, is really poorly marked. i had no idea that was a bike lane until I rode past and saw the markings pointing bikes down onto the old bike lane. The only marking is a bike painted on the side walk. That’s the last place I am going to look when I am crossing a busy intersection. How hard would it have been to put up a sign at eye level? its better than what was there but its C+ work at best. I guess I never saw the old design. I’ve only been riding on this path for about six months or so. So maybe this redesign happened before I got on it? It’s great though. I’ve always felt very safe riding Terwilliger. A 5 year old could ride this…. Looks a lot like a sidewalk to me. « Should we open suburban bike lanes to other vehicles?